1. NYLON: Heat Stabilized Composition, MIl-M-20693, Composition A, Type 1. METAL EYELET: Aluminum, anodize in accordance with MIL-A-8625. 1. Dimensions are in inches. Dimension “D” is applicable in closed position. 2. Remove all burrs and sharp edges: break all sharp corners. Mold marks and normal vent flash are permissible. 3. Metric equivalents (to the nearest .01 mm) are given for general information only and are based upon 1 inch = 25.4 mm. 4. 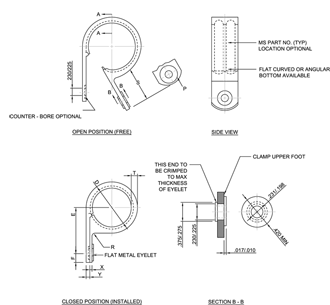 Side gate cut-off permissible providing “D” diameter and inner edge radius are not disturbed. 5. Configuration may vary from that shown, provided dimensions are not exceeded. 6. Tensile strength: Tensile strength for base numbers 2 through 10 shall be 100 pounds minimum and for dash numbers 11 through 32 shall be 225 pounds minimum. 7. Mounting holds may be slightly elongated or dished for easy removal from mold. 8. Odd dash numbers 19 through 31 for Style R are not currently available. The letter “F” or “R” shall precede the dash number size to indicate whether the clamp has a flat or ribbed inner diameter. MS25281F6 clamp loop plastic, wire support, flat inner diameter 3/8 inch bundle diameter. MS25281-r6 clamp, loop, plastic, wire support, ribbed inner diameter, 3/8 inch bundle diameter. 10. 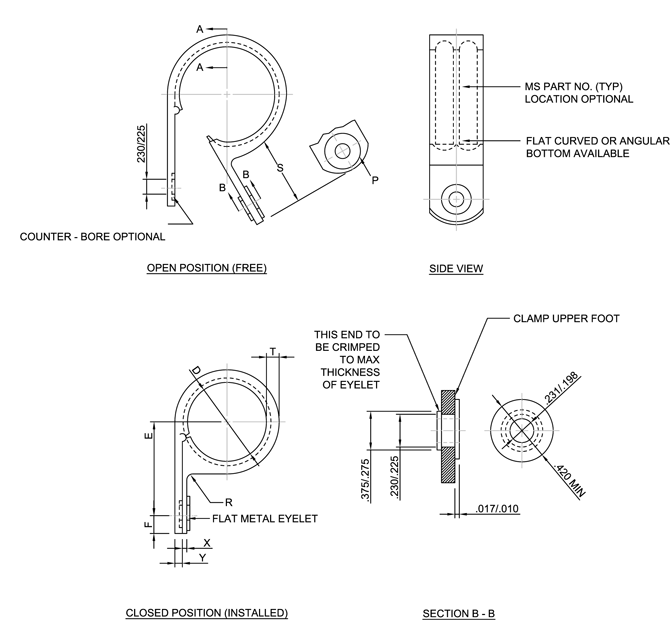 For design feature purposes this standard takes precedence over procurement documents referenced herein. 11. Referenced documents shall be of the issue in effect on date of invitations for bids, or request for proposal except that referenced adopted industry documents shall give the date of the issue adopted.